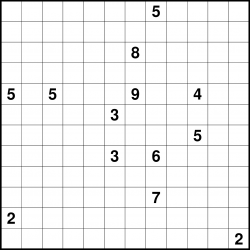 Nurikabe is one of my favourite puzzles of all time. 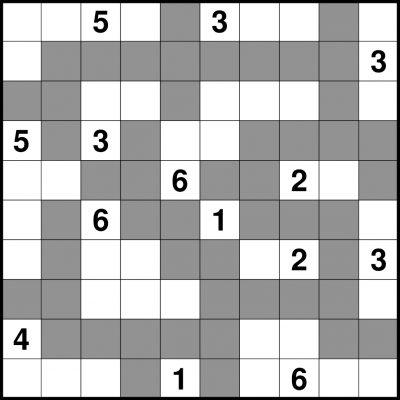 The aim is simple but the puzzle has a great deal of subtlety - yet is well-bounded enough that you can nearly always make progress on any puzzle, given enough time thinking about it! 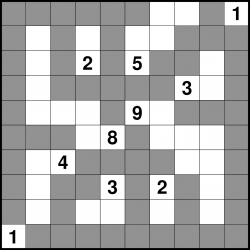 The aim of Nurikabe is to shade in certain squares so that every given number in the puzzle remains as part of a continuous unshaded area of the stated number of squares, with the proviso that there can be only one number per unshaded area. 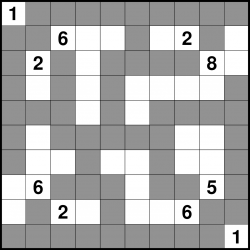 Shaded squares cannot form any solid 2x2 (or larger) areas, and together all the shaded squares must form one single continuous area. White areas cannot touch each other in either a horizontal or vertical direction. One of the nice things about Nurikabe is that there are various ways to think about solving a puzzle, all of which can help when you get stuck. 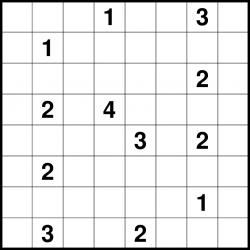 You can look for 2x2 areas that can only be reached by one (or a limited number) of unshaded areas, or you can try growing areas from the existing numbers - or you can do the converse, growing regions that must be there but which you don't yet know the size of. 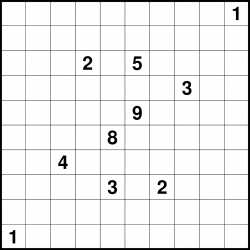 There is only ever one possible solution to a Nurikabe puzzle, which can always be reached via reasonable logical deduction. 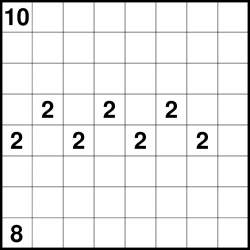 We can supply Nurikabe puzzles at a range of sizes and difficulties, and all of our Nurikabe puzzles are entirely hand-made (although we do have dedicated software we have written which checks the result to ensure that we don't make a mistake).